I created my concept of investing in comic books in the 1990s. Back then a few of my friends noticed the value of comics increasing and I was making a profit selling my back issues. They asked me how they could get into "investing" in comic books. Their purpose was for long term not a quick flip. I said I could put together a package of comics I though would increase in value over the years. They weren't big investments $50-100 so if I was wrong they weren't out allot of money. I've done it for a few people and everyones happy with their "investments". Over they last 10 years the growth in comic books and original comic art as investments has really exploded with big money being paid for comics and original art. In the not to distant future we should see our first $1 million sale of a single comic book. That book will most likely be Action Comics #1. This book features the first appearance of Superman and the start of comic books as we know them. This book is on every collectors/investors wish list and demand out weighs supply by a staggering amount. With Action Comics #1 currently listed in the Overstreet Annual Comic Book Price Guide #39, the bible for comic collecting, in Near Mint Minus for $750,000, this all but excludes everyone but the extremely wealthy. My solution, since I don't have $1 million sitting in my bank account last time I checked, is to create a group of investors to purchase the high valued comic books and original art. Working kind of like the stock market ex: buying "shares" and receiving profits when they are sold. They "shares" will be x mount and you buy as many as you want. The money will be pooled into a fund where we purchase comics books and original art with two goals. The first goal being acquiring comics and original art that we can purchase for selling and trading. The second goal acquiring for long term investment. With the Internet it's allot easier for the average collector/investor to buy and sell for increasing their collection or making money from their collection. They are sites that specialize in high grade or investment grade comic books for buying, auctions, or selling your own comic books and original art. What we at comicsasinvestments.com will do is to open an account on various sites for buying and selling our comic books and original. This way investors we be able to watch the progress of their "investments". On top of that we will also be looking locally and to other sites for new investments for profit and long term. Why invest in comic books? This is the hardest hurtle to over come. There is a stigma with comics books that they are something disposable, something for kids, basically something that has no value. I must say that things are changing rapidly. With Hollywood making billions of dollars on comic book properties and realizing that comic books aren't for kids anymore. With more and more big budget Hollywood movies being made and making so much money people are being re-acquainted with comic books and are starting to collect/invest. There is one auction site that deals in collectibles named Heritage Auctions, Inc. They just finished their Heritage's Vintage Comics and Comic Art Auction on August 14-15, 2009. The auction was a major success bringing in $2.1 million over the two days. 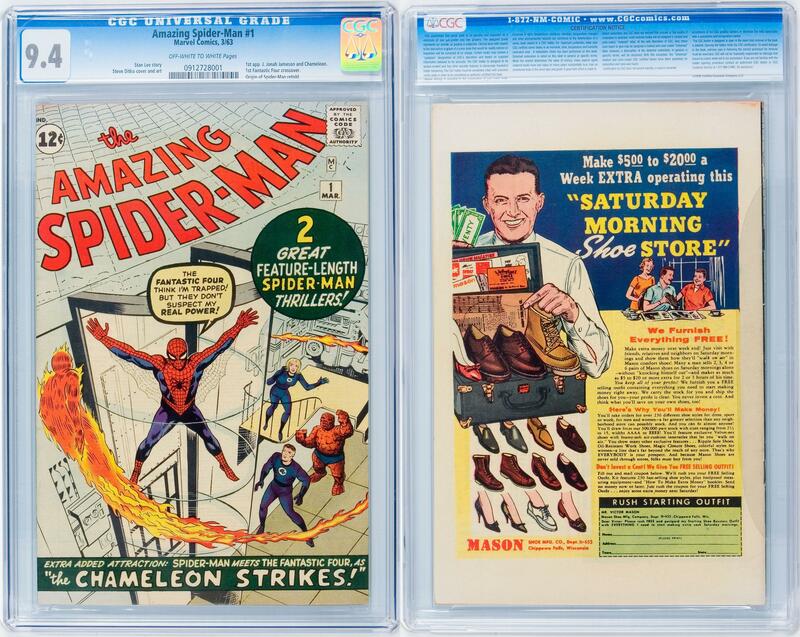 One of the highlights of the auction was a CGC Graded Near Mint copy of Amazing Spider-Man #1 selling for $83,650. The Overstreet Annual lists Amazing Spider-Man #1 in Near Mint Minus for $44,000. That is almost double the value listed in the Overtsreet Annual. There are other sites doing the same kind of numbers. It's not like this was a fluke auction. When I show people these results they start changing their mind about comic books and investments. The goal with comicsasinvestments.com is to invest in comic books and original art for fun and profit. I plan to make investors money while building a portfolio of comic books and original art for long term investment.